Earn $2.65 in Rewards credit (265 points) What's This? 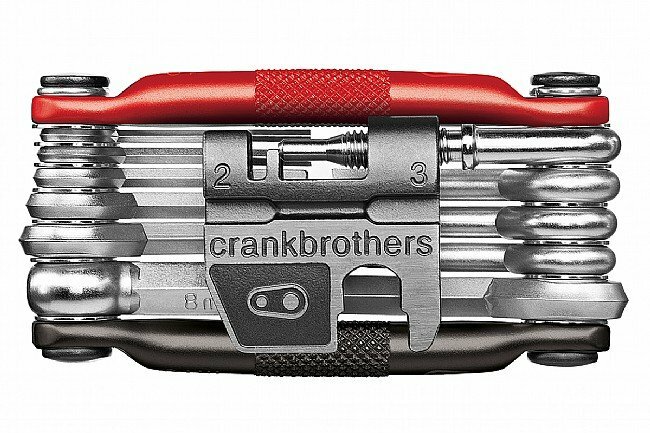 The Crank Bros Multi-17 Tool is a compact assembly of 17 of the most often needed tools for roadside and trailside repairs. The foldable design means this tool is easily stored in a jersey pocket or saddle bag so it's there when you need it. The frame is made from lightweight 6061-T6 aluminum frame, with tools of durable 6051 high tensile steel. Very solid tool, quality steel, no unnecessary parts, love it. I dont get on the bike without it. Have cranked on this tool for a couple of years now, and none of the edges are stripping. 11 miles from the trail head my chain broke. Pulled out my palm sized CB 17, fixed the chain. Don't leave pavement without it. You could tune shopping carts and rebuild a gocart with this thing! You can get a good grip on the tool. which makes it easy and comfortable to use. This also makes it difficult to use it tight spaces. To wide to allow me to make adjustments to my 29er disc brake piston through the spokes. great all around tool, will have years of use. Great tool for all bikes! I purchased this multi-tool for my husband who commutes by bike every day. He has been using it regularly and is very happy with it overall. It's very sturdy and seems like it will last forever. It has nearly every tool needed without having to bring nearly every tool in your toolbox. I have one of these in my bike bag for each bike so I can't forget it, relatively low weight and very useful, if you are out in the boonies and something happens this tool can be the difference between a long walk and getting home on your bike. Just what I was looking for. Well made and a cyclists friend indeed. I got this multi-tool to prepare myself for the worst. It has nearly everything you could need (aside from a tire lever). I was so glad I was carrying it when my wheel came out of true on a ride and I was able to use the spoke wrench (conveniently located within the chain breaking tool) to get my wheel true enough to ride to a bike shop! Highly Recommended! Easy to carry in bike bag and has several tools that make the repairs on the road easy. This is the third one of these I've purchased-I have one in the seat bag of each of my bikes. 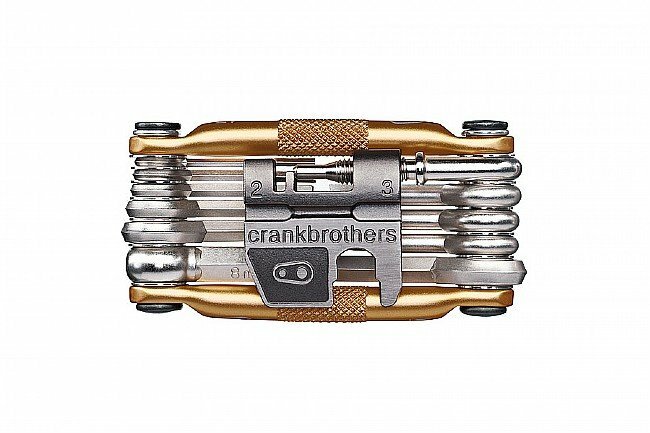 I have used these for a number of on the road adjustments and have even used it to repair a chain. It's sturdy and is easy to use and covers almost every adjustment you might need to make when riding. Great tool, very solid, had to use the chain tool this past week and it worked well. I love the solid feel of this thing even though it is pretty heavy. This tool really comes in handy when you're on the road. It really is a great tool to have when you go on long rides. Saved my bacon on more than one occasion. It has all the necessary tools you need to make quick repairs. I especially like the chain tool. Best of the compact tools out there. I have one of these tools in every bike bag. They have never let me down. I have one that keeps falling apart because it lost a bolt that held all the key together but it still function properly. Highly recommended tool. The tool has all the right tools for riding and taking care of repairs. Took me a while to figure out that you could unscrew the spoke tightener/chain tool from the body of the multi-tool to effectively use the spoke tightener. My biggest complaint with the tool is the the head of the philips screwdriver is a little too large for adjusting my derailleur and there is no way to keep the screwdriver (and other tools) locked in the up position. When you apply any force these tools fold back down. But it is an emergency tool and in that regard it gets the job done - just harder to use than I had hoped. First of all, it has a 4mm hex wrench (not a 3.5 as listed in product description). I have mine sitting in front of me while I am typing this review. As for Quality, it's excellently machined, well made, a little of the hefty side. My plan was to pull out my Park Folding Chain Tool and Park Spoke Wrench out of my mini seat bag and replace them with the Multi 17. The Multi 17 would not fit, took up almost as room as my 700 road tube. Decided to pack it in my jersey pocket instead. It has tools that I will never use. Only hex wrench's I use on rides is a 5,4,3. Phillips screwdriver is too large to use on my derailleurs. No need for a flathead anywhere on my bike.8mm will work for my Look pedals, Never had one come loose on a ride. I broke a chain in my garage for an experiment, using the chain tool. It took a lot of leverage and I had to hold the tool with a rag in my left hand, could not do it otherwise. However in over 40 years of riding I have only broken one chain. 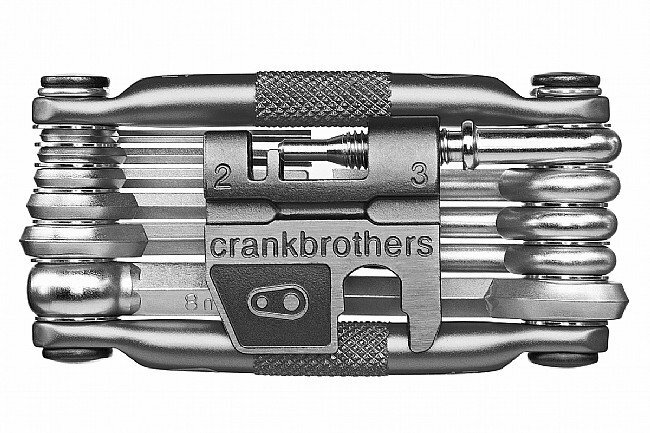 This is like the Swiss Army knife of multi tools. I used to pack a Park CT-5 Mini chain Brute. Used it when I broke my one chain. Worded just as well in my shop. I imagine I will never have to use this critter, but it's nice to have just in case. Thanks for the review, and for the heads up about the error in our description! You're correct that there's a 4mm hex wrench included in this multi-tool; we've gone ahead and added it to our description. Best tool I ever owned. This is a great tool, nicely made and finished. Allen size is clearly marked. Cleverly designed chain and spoke tool. At 168g it's still suitable to keep in your saddle bag and with the smooth strap it can easily go into your jersey pocket as well. If you can't fix your problem with this tool you probably need to call a cab.